Two good views of the future Expo/Crenshaw Station on the Crenshaw/LAX Line. 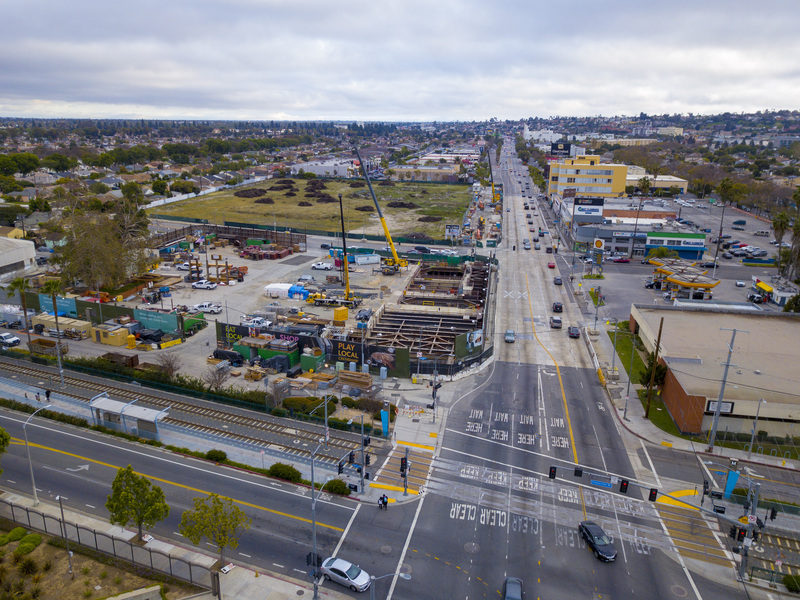 The pics showcase a decked Crenshaw Boulevard and some of the surrounding development sites. Metro’s proposed joint development site is on the right side of the bottom pic, just below the Shell Station. The big empty lot on the left side of the bottom pic is the location of District Square, a planned multi-level housing development with commercial space. In the big local transpo news of last week, the City Council approved building the LAX people mover as a $4.9-billion public-private partnership. Opening date is targeted at March 2023. The people mover is obviously a big part of the effort to get rail into LAX. 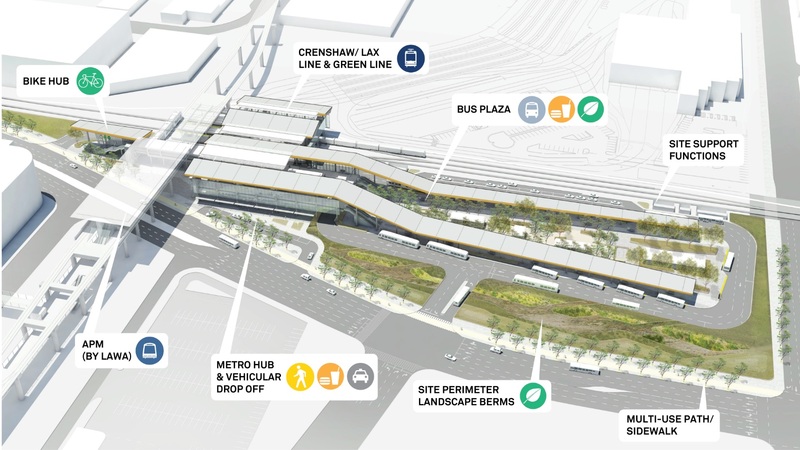 The other part is the new transit station that Metro will build at Aviation and 96th Street along the new Crenshaw/LAX Line tracks. 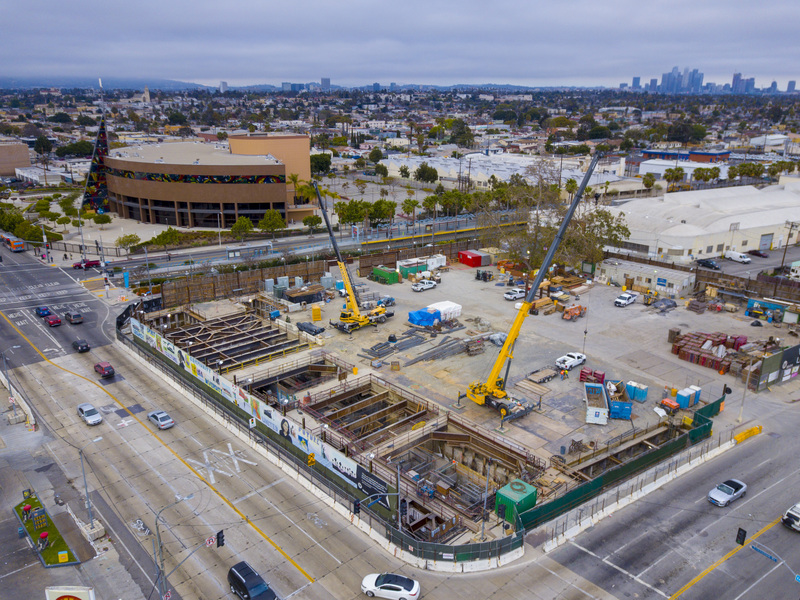 That station will be the transfer point from the Crenshaw/LAX Line and Green Line to the people mover and will also serve buses, bikes and drop-offs. The APM will have nine trains, each with four cars. Each car will carry up to 50 passengers and their luggage, with a total of 200 per train. Train speed will top out at 47 mph. Trains will be available at each station every two minutes with a total of 10 minutes travel time end-to-end. For easy access, the APM trains will have large, wide doors and each car will have 12 seats designated for travelers in need. The APM will be FREE for all users and operate at all times. Anticipated use will be 30 million passengers per year. For those wondering about travel times to LAX from DTLA, transit observer Scott Frazier offered some thoughts on Twitter — click below to see the entire thread. Also, the best way to improve trip times to the airport would be to speed up Expo. This is one reason Uber has pursued self-driving cars: to cut labor costs. I’m skeptical that will work. I think it’s going to take a tremendous workforce to oversee and maintain fleets of robot cars — should that even come to pass. Another thought: there’s little doubt that Uber and Lyft have cut into transit ridership in the U.S. with Uber/Lyft offering door-to-door service that transit can’t mimic. But one thing overlooked is that both Uber/Lyft and transit are subsidized. Uber/Lyft by venture capitalists and transit by the public, respectively. Whether in a Uber/Lyft or on the Red Line, your fare is not covering the entire operating cost. Transit, of course, is a public service and is not expected to turn a profit (not that profits are a bad thing). Uber/Lyft are for-profit companies and it seems to reasonable to think a day of reckoning will come when their fares will go up. The service they offer may be so essential that consumers overlook fare hikes, but it’s hard to read the New Yorker article and think the status quo will remain the status quo. The mayor of Los Angeles and Metro Board Chair hasn’t formally declared that he’s running for president in 2020. But he’s obviously mulling it — as his visit this weekend to the home state of Radar O’Reilly made clear. I note it here because Garcetti was (and continues to be) so heavily involved with Measure M, Metro’s most recent sales tax measure. If he runs, it will be interesting to see how much (or how little) transportation and urbanism become part of a national campaign. A motion by L.A. City Council Member Paul Koretz would grant The Boring Co. a categorical exemption from CEQA to build a 2.7-mile ‘proof-of-concept’ tunnel between West L.A. and Culver City. The proposed tunnel would provide proof of concept for a zero-emissions, high speed, underground, alternative means of transit for personal vehicles and/or single-rider use. I don’t know who dropped the watermelon on that sentence but geez Louise. Attentive Source readers know that Metro is also working on its own transit network in the L.A. area. That includes the subway tunnel under construction for the Purple Line Extension, the partly-underground and aerial Crenshaw/LAX Line, the underground Regional Connector, an extension of the Gold Line to Claremont and Montclair and the future Sepulveda Transit Corridor between the Orange Line and LAX. The LAT will continue to have a DTLA presence although the bulk of the operations will move to a new campus that sounds pretty nice. On the other hand, staffers who continue to live east or north of downtown should prepare for some very tough commutes. For those who take transit, the Crenshaw/LAX Line to the existing Green Line will probably be a faster alternative than the Silver Line for the southern leg of the journey. (The Crenshaw/LAX Line is scheduled to open in fall 2019). How will this impact the paper’s coverage of our region? Hard to say. The good reporters will continue to be good reporters and find good stories — and the LAT continues to publish some stellar work. If there is an impact it’s that over time the paper’s managers and editing staff — the folks who decide what gets published — will likely end up living on the far Westside and that will be the world they encounter and know about on a daily basis. That could mean more coverage for South Bay cities, Inglewood and parts of South L.A., just as it may mean less exposure to the northern and eastern parts of our region. (Some LAT staff reactions are here). Quasi-related, Metro staff had the chance to sit and chat with a bunch of high schoolers on Friday and I think the greater challenge for Metro and the LAT isn’t overcoming geography — rather, it’s getting the young folks to realize we exist and consume our products. A cat ex for a 3 mile tunnel seems ridiculous. How is Metro ensuring that the tunnel doesn’t interfere with Metro’s Sepulveda Pass line given that the Sepulveda Pass line route hasn’t been selected yet? At this point, the agency is monitoring the private project. “I don’t see how requiring a large segment of the population to walk an ADDITIONAL 1,000 feet to reach their terminals is progress. But this is what LAWA wants to happen and is spending $5 Billion to ensure that this happens. “Note again that LAX offered no solution for those who for one reason or another cannot use the APM due to these excessive walking distances. These passengers are on their own. “LAX is apparently concerned ONLY with those arriving at or departing from LAX via private automobile, with apparently little concern for those those using public transit who MUST use the APM and endure these long walks, and allow an EXTRA 15 minutes to their total travel times. “You will have to walk for 8-10 minutes to go between each of the various terminals. or up to 40 minute between T1 or T8 and the Bradley Terminal.. LAX is too cheap to add an airside (inside Security) APM..
“That is only part of the problems with this lousy design. The walking distances FOR ALL PASSENGERS NOT ARRIVING/DEPARTING BY PRIVATE AUTO will be up to 1,000 feet more than they currently endure, with UNASSISTED (no moving sidewalks) walking distance of up to 600+ feet. It will also add 10-15 minutes to travel times to and from LAX. “This penalizes ALL those who use public transportation, including their FlyAway express bus service, and those using Super Shuttle, rental cars, and hotel shuttles. “On top of this, there will not be any one-seat rail service between LAX, Downtown LA, and Union Station. Instead, Metro patrons will have to transfer between the Blue and Green Lines. As a result, this service will carry a paltry 0.7% of LAX traffic. This compares to the 11% of JFK traffic that uses rail between JFK and Manhattan. If anything, the APM and PT expansion is more of a way to get employees to the airport. They’ll probably be more likely to use it than other folks. I do hope that LAWA revises the plan to include moving walkways. My understanding is that moving walkways are already in the plan and have been for some time. It was stated a few times as I recall. It would be insane not to have them. If you look at the close-in rendering of one of the APM stations with the walkway underneath the tracks, you’ll see the moving walkways inside. You had me worried there for a second haha! As much of a game changer for LAX as this will be (as i know I will definitely use this for many if not most LAX trips) having the APM loop around the horseshoe would have been a far better plan but hopefully the moving walkways will offset the distance at least somewhat. I’m guessing this was designed as such so to avoid minimizing traffic disruption in the horseshoe during construction (like the gold line bridge over the 101 being designed as not to impact traffic below). If so, then it’s yet another example of how these kinds of disruption mitigation practices for cars end up creating inferior long term transit infrastructure. We have to change that philosophy. The roads going to LAX need to divert to the people mover station instead of the horseshoe. This is likely difficult when you exit on N Sepulveda Blvd off the 105 freeway leading to the horseshoe for departures and arrivals. I wish the PM will do a full circle to each terminal. Nonetheless, it’s a nice start. They need to offer free luggage carts so customers will use the service. Will they fix the horseshoe? They need to allow drivers to exit quicker upon drop off so they don’t contribute to the congestion. Drivers going to the later terminals shouldn’t have to drive through terminals 1 to 3 and Bradley Intl. It seems that eventually there will be plans to toll private automobiles when entering the horseshoe. Fastrak transponder sensors are already in place. The APM will be helpful in also getting rid of those hotel and parking shuttles from forever circling. I’m unaware of any firm plans to toll the horseshoe although I’ve written in the past that it seems the kind of place where congestion pricing may be viable given there will be more alternatives for getting to LAX in the future. Completely agree that getting the shuttles out of the horseshoe will help keep things moving. There actually are exit shortcuts bypassing parts of the horseshoe, but they’re not so obvious. After terminal 1, you can make a quick left on East Way, past the parking garages, to make another left in front of terminal 7. Then there’s West Way, after terminal 2, which will get you in front of terminal 5. Merging across several lanes of slow moving traffic is never easy, though. Will we still be required to TAP on free ride day? On Sunday I took Metro from Arcadia to Torrance for my long-run from Torrance to Santa Monica, and back via Expo/Silver. I’ll do that again next Sunday, I’m glad it’ll be free, but it sort of boggles the mind how we can go something like 38 miles for only $5 round trip. This is just another example of poor planning. The Green Line was supposed to go into LAX and a turn-out was built to provide this service. Instead we have this convoluted disaster where a new turn-out had to be constructed in order to connect with the Crenshaw Line and then another rail line, People Mover to access the airport. So it’s not just one inconvenient transfer from the Expo Line to the Crenshaw Line or the Blue Line to the Green Line but an additional transfer to the People Mover. Added to that is a longer walk once inside the airport. If Los Angeles is not the laughingstock of the traveling world currently, they certainly will be when this fiasco is completed. You expressed my observations perfectly. This is EXACTLY what they accomplished! I totally agree with your longer post. No one using the APM will have a better experience than the shuttle buses from the Green Line. And it will be hell for the disabled and those with children or lots of luggage. I wonder if there could be an ADA suit to provide better access for the disabled?? So why is Councilman Koretz trying to give a free-pass from CEQA to the Boring Company and not for Metro? I think Metro would gladly take not have to do the lengthy studies and fight expensive lawsuits to get their projects done. Probably would save millions (billions?) in funds and accelerate projects to a few years instead of 6-10. Now, a company that was started on a whim a year ago might get to bypass all that and perhaps interfere with long term plans that voters already agreed to (through Measure M)? Why does an individual private company get such privileges and benefits? I don’t think other private companies or public entities get such perks. Seems completely unfair. The Los Angeles Times’ new home will be located at 2300 E. Imperial Highway, El Segundo. Isn’t that a nice, convenient walking distance from Metro’s Aviation Blvd. Station?. Thanks for your kind words. Unfortunately, ALL THOSE arriving at or departing from LAX by public transportation will be forced to use the APM and walk as much as 1.000 feet more to reach their terminal. Same is true for those unfortunate passengers who are dropped off or picked up at the Metro W96th Street Station. They will have to be dropped off or picked up at the terminal curbside to avoid this fate. Using Metro Rail will not be an advantage. In short, the LAX Overriding Design Philosophy is PRIVATE AUTOMOBILES YES, PUBLIC TRANSPORTATION NO!!!! As for an ADA suit, I see the definite possibility that there will be several, To avoid this, LAX will have to provide FREE Skycap Service and FREE manned carts at all APM stations and at the Metro W96th Street Station and all the baggage claim areas. As stated in another comment on the lack of sufficient moving sidewalks. Frank: I’d like to look at the DEIR report, but I can’t find it at the link that you provided. My further Google search was unsuccessful as well. It appears that LAWA has removed the document from circulation.